''In September last year a group of people from across Australia gathered in Alice Springs to mark 50 years since the lease was first signed for the Pine Gap US military intelligence base. Most people don’t know much about this facility just south of Alice Springs, and for good reason – the base and what it does has been intentionally kept secret. But over the years it has been used to gather intelligence for the CIA, NSA and the US military; as part of the US nuclear weapons program; and used to target unmanned drone bombings. 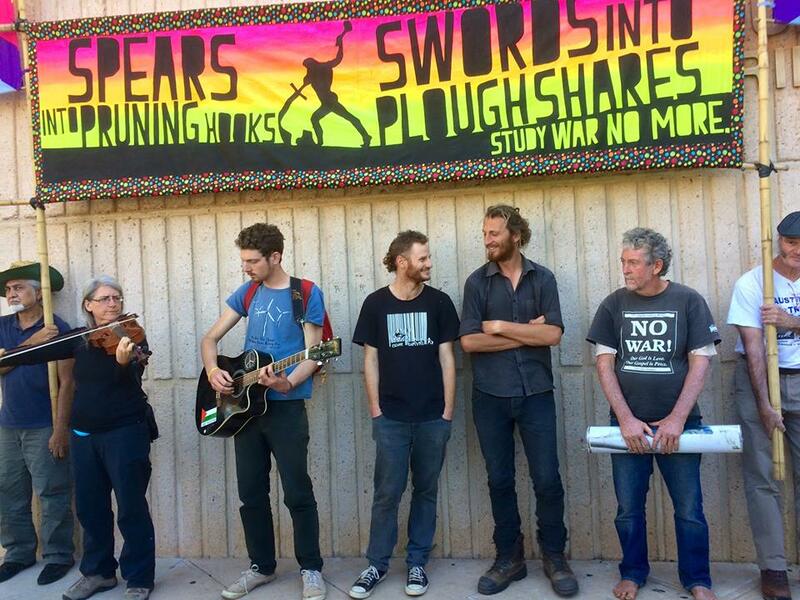 A group of six of us – Jim Dowling, Margaret Pestorius, Paul Christie, Andy Paine, Tim Webb and Franz Dowling – decided a way to bring attention to Pine Gap and what it does was to walk on to the base as “peace pilgrims” - carrying musical instruments and an image from the US war in Iraq to lament the death and misery caused by Pine Gap. The group was not just brought together by this action. Three of us live together in Dorothy Day House in Brisbane, where we live simply and communally and open our doors to friends and strangers. Jim has for many years been living in similar communities, and Margaret also is a long time friend. We have all been involved in peace activism for some time, but also see this as just an extension of our lives spent trying to live consistently with our values of love, justice and sustainability. For our non-violent lament, we were charged under the Defence (Special Undertakings) Act – a rarely used law which carries the remarkably strict maximum penalty of 7 years in prison. From November 13-23, we will face the Supreme Court in Alice Springs on these charges. We hope to use the court case to put Pine Gap on trial – ask whether our lament can really be considered the immoral act while Pine Gap spies on the whole world and kills people in their home by remote control. To help us do that, we are hoping to call a number of expert witnesses to court to talk about what Pine Gap does. To get people to Alice Springs, of course, costs money. But more than just giving money we ask you to help us by spreading the word on Pine Gap, what it does, and the resistance by an ordinary group of friends who could not turn a blind eye to the violence perpetrated in the centre of our country.